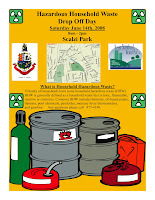 One thing I love about doing Stamford Talk is that I find out about awesome events like Hazardous Waste Disposal Day. Doesn't that sound great? If not, then at least the flier looks dramatic. YOW, that is yellow! Always Home and Uncool sent me this link, along with, I think, some sort of insult relating me to toxic waste. Man. The Stamford blogger scene is getting intense. The event (I call it an event because I expect great things) is June 14, from 8am-2pm, at Scalzi Park. That's next Saturday. The Stamford Skatepark is also at Scalzi, so you should drive to the back of the park and see the skaters, too. Thanks that will save me a midnight drive to New Jersey. Full disclosure: Last time I needed to dump my toxic products, I brought them to GREENWICH's waste day. Heh, heh, heh. Why am I not surprised that you got info on toxic waste cleanup day from the "Uncool" dad? Whatever you do, make sure you get out of Scalzi (or as MSN Maps calls it, Woodside) Park before dark! Ha! You haven't heard yet about the arm wrestling contest we're having at Monster B's at our meetup next Friday?